I began making fiber art in the 1980s, beginning by imagining ways to make traditional quilt designs more free form. 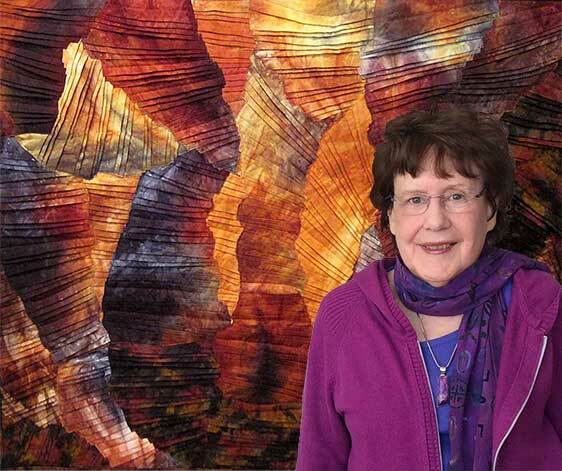 As my work developed, experimentation led me to create new designs using curved piecing, fused landscapes, and eventually pleating curvy strips of hand dyed fabrics to mimic the striations in rocks and canyons. Life events sometimes spurred changes in my work, making it more abstract and personal. Oceans, rocks, and trees speak to me of survival through the storms of life. The eternal cycles of nature sustain my spirit and inspire my creativity. I hope you will enjoy exploring the evolution of my work over time. For prices and more information, please contact me. Website conceptualization by Donna Radner and Sherry Margolin. Graphic design, Photoshop, and HTML wizardry by Sherry Margolin. Photography by Donna Radner, Mark Gulezian, Paul Elbo, George McLennan, and Sherry Margolin.